With each beat your heart sends out an electrical impulse. Although this electricity amount is very small, it can be picked up with ECG (EKG) electrodes attached to the skin. You’ve probably seen ECG monitors in movies. Its the medical apparatus which generates squiggly lines which let you know whether your heart rhythm is showing signs of atrial fibrillation or is beating in a normal pattern. While there is no shortage of heart rate training chest straps, ECG monitors have not been available to amateur fitness enthusiasts until recently. Now there is a healthy range of devices which are capable of dishing up a pulse waveform similar to what you’d get from a professional electrocardiogram. Its worth noting, most of these wearables will not do a perfect job. But the hope is they may warn some people who do not know they are living with a heart condition. Of course, self-diagnosis should always be avoided, and you should refer to your physician for a medical interpretation of your readings. With that out of the way, here’s our selection. QardioCore is a smart, wearable ECG monitor. A number of years in the making, the device is designed to improve detection and management of cardiac conditions. Six subsystem layers of QardioCore’s sensor system record and analyze over 20 million data points daily along with other important heart metrics. To use, simply wear it around your chest as you would a heart rate band. The gizmo records your electrocardiogram, heart rate, heart rate variability, body temperature, respiratory rate, activity and stress level. Alongside the ECG trace, the accompanying smartphone app offers friendly data visualization that is simple to understand. QardioCore is a nice bit of kit but fairly expensive. Its particularly suited for people with increased health risk caused by family predisposition, history of heart attacks or strokes, high blood pressure, high cholesterol, diabetes and excess weight. Many expected AliveCor to be squashed by the launch of the ECG enabled Apple Watch but the opposite seems to be happening. Not only have their sales doubled since the Apple event earlier this month, but AliveCor is going on the offensive by preparing to release a more accurate smartphone ECG reader. Its FDA approved device currently comes in two versions. One that attaches to your smartphone or tablet, and another that comes in the form of a wrist strap for your Apple Watch. You press on the band with your thumb (thumbs on the smartphone version) to take an ECG reading. The accompanying Apple Watch application will process the data and let you know whether your heart rhythm is normal or if atrial fibrillation was detected. Typical ECG sensors have only 1 or 2 leads. AliveCor says its working now on a yet-to-be named 6-lead ECG reader which will be able to pick up about 100 different diseases. The upgraded device is set to launch sometime in 2019. The current version, though, is available to purchase now. Much has already been said about Apple Watch Series 4. With each passing year, the device is edging closer to becoming your must-have health guardian. In addition to other hardware and design improvements, the latest iteration comes with fall detection, irregular heart rate alerts, low/high heart rate alerts and more. The biggest surprise of all, though, was the inclusion of an FDA-approved ECG sensor. Readings are on-demand. To take a measurement simply rest your finger against the digital crown while wearing the watch. This creates a closed circuit between the digital crown and the sensor on the back. Built in electrodes will then work to detect electrical impulses from the heart. It takes just 30 seconds for a pulse waveform to be generated. You’ll get a full report and the app will let you know if your heart rhythm is normal or there are issues. There is also a PDF with all the info so you can forward the info on to your doctor. WIWE is a clinical-grade ECG monitor. The size of a business card but slightly thicker, it can fit easily into your pocket or bag. You might even manage to slip it into your wallet! The gizmo goes further than most other such devices on the market in that it offers more detailed analysis of your readings including irregularities in the ventricular department. And it has been proven to do this with 98.7% accuracy. There are also some extras such as SpO2 measurements and the ability to count steps. In our review we found the device worked exactly as advertised. If you have reason to be concerned about your heart health or already have a diagnosed condition, WIWE may end up being a life-saving investment. Omron Complete is an upper arm blood pressure monitor that allows you to keep tabs on your ECG readings and share them with your doctor. This means you’ll get a complete picture of your heart health from a single device. ECG readings are obtained by touching electrodes located on the top face and both sides of the monitor. The device was developed in partnership with Alivecor. Complete uses a new algorithm developed by AliveCor which has greater success at detecting the possibility of Afib. Hoxoskin has a line of smart shirts which offer activity, cardiac, and respiratory monitoring for continuous personal health, fitness and sleep assessment. 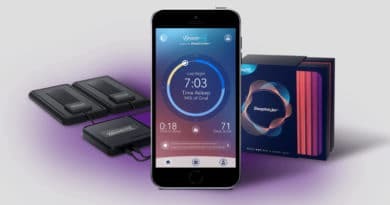 This includes an ECG and heartbeat monitor, HRV (allowing stress monitoring, effort, load and fatigue assessments), heart rate recovery and more. A small device slips into the shirt pouch to capture data in real time. It then sends it all via Bluetooth to a smartphone app which dishes out various insights. Hexoskin Smart is compatible with iOS and Android, as well as the Apple Health App, Apple Watch, and Wear OS. You can even sync data with third party apps such as Strava, RunKeeper and Endomondo. The line of garments is available for both men and women. There are also short and long sleeved versions to choose from. The Canadian based outfit says its products have been chosen by a number of space agencies, military organizations, and professional sports teams around the world. The Amazfit Health Band has been around for about a year and a half now. The band has the usual sensors for monitoring movement and sleep and a PPG photoelectric sensor for keeping tabs on your ticker. All these readings can be seen on the 0.42 inch OLED display and smartphone app. But it gets more interesting. The band can also detect heart rate variability (HRV) in real time, and it has a chip that can pick up on ECG data. Just like on the Apple Watch, the ECG readings are on-demand. Huami disclosed that the first generation health band has collected more than 5 million ECG data points since April last year. Amazingly, this has enabled doctors to confirm symptoms of atrial fibrillation in more than 14,000 instances. We are guessing the bulk of this is in China as the original band has not officially made its way across the border yet. The company has recently announced a new version. We’ve been told its set to reach the US market by the end of this year. Look for our review shortly before the launch. A Kickstarter project, CALM is meant to be attached via an adjustable chest belt or a disposable gel pad. Once in place, it will sense your movements and ECG signal from your heart. The ECG signal shows the “shape” of each heart beat and can tell you more about your physical and mental condition than heart rate alone. The accompanying app then uses this data to let you know if you are pushing too hard or slacking off. HeartBit looks like a chest strap but this is where the similarity ends. To use, you need to slip the gizmo into a special training top made of high-quality moisture-control fabrics. From there it takes real-time heart monitoring to the next level by measuring electrical signals produced by your heart with laboratory-like accuracy. HeartBit essentially acts like a 3-lead 5-sensor ECG monitor that can detect signs of arrhythmia, atrial fibrillation and warn you of potential anomalies. The device allows users to keep their cardiac health in check so they can strive towards their fitness goals without incurring any harm. HeartBit takes measurements at a frequency of 2,000 Hz per electrode, which means 10,000 data points per second in total. To fulfil this vision, the 5 strong team has teamed up with IBM. The device is still in the works and we have no details on final pricing or a launch date. You can register, though, on the company’s website to be kept informed of progress. How about Galaxy watch ACTIVE? It doesn’t have an ECG sensor. Correct — it will supposedly have blood pressure monitoring, but no ECG.